The Global Volcanism Program has no activity reports for Myokosan. The Global Volcanism Program has no Weekly Reports available for Myokosan. The Global Volcanism Program has no Bulletin Reports available for Myokosan. Myokosan is a steep-sided stratovolcano north of Nagano City that overlooks the popular resort of Lake Nojiri below its SE flank. A 3-km-wide caldera breached widely to the east is filled by a flat-topped lava dome that forms the basaltic-to-dacitic volcano's summit. It was constructed during four stages beginning about 300,000 years ago, each evolving from basaltic to andesitic and dacitic eruptions. The latest eruptive stage began about 43,000 years ago. Several episodes of edifice collapse during the late Pleistocene to early Holocene have produced major debris avalanches that traveled to the east and NE. Pyroclastic flows traveled down the eastern flanks during the mid-Holocene about 5800 and 4200 years ago, and the latest dated eruption produced pyroclastic surges about 2800-2500 years ago. No historical eruptions are known at Myokosan, but constant solfataric activity occurs between the dome and the south caldera wall at a place where sulfur was once mined. Hayatsu K, Arai F, 1980. Tephrochronological study on the Myoko volcano tephra layers and their relation to activity of the volcano. J Geol Soc Japan, 86: 243-263 (in Japanese with English abs). Kawachi S, Hayatsu K, 1994. Debris avalanche and lahar deposits in the Yatsugatake volcanic chain and Myoko volcano, central Japan. J Nat Disaster Sci, 16: 55-69. There is no Deformation History data available for Myokosan. There is no Emissions History data available for Myokosan. Myoko is a steep-sided stratovolcano in west-central Honshu that overlooks the popular resort of Lake Nojiri. 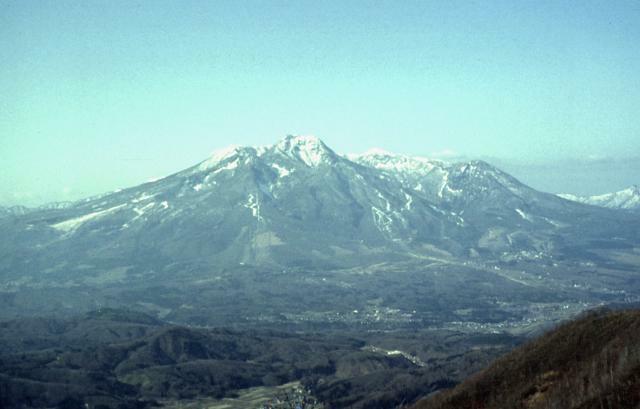 This springtime view from Madarao, SE of Myoko, shows a 3-km-wide caldera breached to the east that is partially filled by a flat-topped lava dome forming the volcano's high point. Several episodes of edifice collapse at Myoko have produced major debris avalanches that traveled to the east and NE. The latest dated eruptions of Myoko occurred during the mid Holocene. No historical eruptions are known, but constant solfataric activity occurs. There are no samples for Myokosan in the Smithsonian's NMNH Department of Mineral Sciences Rock and Ore collection. Large Eruptions of Myokosan Information about large Quaternary eruptions (VEI >= 4) is cataloged in the Large Magnitude Explosive Volcanic Eruptions (LaMEVE) database of the Volcano Global Risk Identification and Analysis Project (VOGRIPA).